KUCHING: More than 600 youths attended the International Youth Congress (IYC) 2017 held to highlight current international issues involving youth like agroprenuership, education and technology. 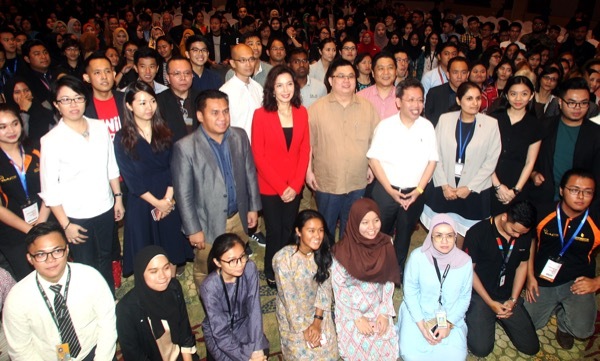 Speaking at the congress, Minister of Local Government Datuk Dr Sim Kui Hian said empowering the youths is crucial in preparing them for the future challenges. “Cyber security for instance, has been one of the most significant faced by the private and public sectors today. The only way to overcome the issue is through collaboration between the youths and the authorities,” said Sim in his speech when officiating at the International Youth Congress 2017 at USCI Hotel here yesterday. “Ensuring that they are being protected by malicious intention is our main focus and they need to be prepared against future challenges. “The issue of education policies will also being addressed, which is Transformasi Nasional 2050 (TN50) as well as the bridge between education and employment sector. “The cluster which touched on the agriculture sector should not be taken lightly as it is an opportunity for the state to redefine its strength. “The implementation needs to be kept at par with the policies made so that none of our resources are wasted. “This congress acknowledges the challenges, threats, opportunities and the voice of youths in today’s fast paced and borderless world,” said Sim. The one day event themed “Forging the Future of Malaysian Youths: Globalise, Inclusive, Nurturing” was organised by MyPerintis. Also present were Serembu assemblyman Miru Simuh, the founding president of MySchool of Life and MyPerintis, Datuk Lawrance Low and other distinguished guest. 600 youths attend IYC 2017 0 out of 5 based on 0 ratings. 0 user reviews.